(Phys.org)—A team of researchers with members from Mexico, the U.S. and Germany has found that the demise of the pre-Columbian Mesoamerican society centered around a city known as Cantona, was likely due to a combination of weather and politics. In their paper published in Proceedings of the National Academy of Sciences, the team describes their study where they compared lake sediments with archeological evidence to provide a clearer picture of life in the area back when the city was still active and what factors led to both its rise and fall. The researchers note that little work has been done to gain an accurate portrayal of what the climate was like in Mesoamerica during the times when various early people lived there, creating civilizations that in many cases vanished leaving behind ruins for modern scientists to ponder. In the case of Cantona, a city whose remains now lie east of modern Mexico City, the assumption by many has been, as it has for other long gone societies in central and South America, that it died due to drought. In this new study, the researchers assumed there was likely more to the story and so sought to find out more about weather conditions during that time. They started by collecting and studying sediments in nearby Aljojuca lake, which provided an accurate picture of drought conditions, before, during and after the time of the people in the area, which is now known as Cuenca Oriental. Prior research has shown that Cantona was occupied from approximately 600 BCE to 1050 CE and that its population grew steadily over the course of its first six hundred years, then grew faster from 50 and 600 CE—but the team notes, the lake sediment suggests that during that time period, the area had entered a drying trend. More interesting perhaps, they found that the population in the city grew even faster from 600 – 900 CE, despite increasing aridity. After that, things changed, though it is not clear exactly why, the population dropped over the following century and a half and then the people disappeared altogether. The team notes that later development in the city showed increased fortifications, which could have either been to repel invading armies or to fend off migrants seeking refuge from a drier environment that left them with little ability to farm on their own. That would explain, the team notes, the continued increase in population during the initial phase of the drought trend. 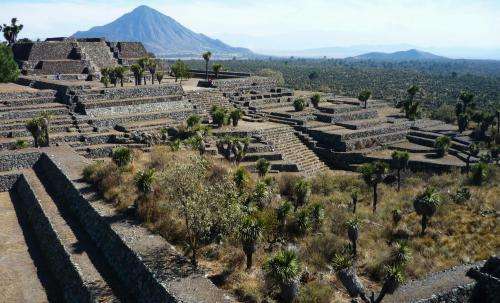 There is currently no consensus on the importance of climate change in Mesoamerican prehistory. Some invoke drought as a causal factor in major cultural transitions, including the abandonment of many sites at 900 CE, while others conclude that cultural factors were more important. This lack of agreement reflects the fact that the history of climate change in many regions of Mesoamerica is poorly understood. We present paleolimnological evidence suggesting that climate change was important in the abandonment of Cantona between 900 CE and 1050 CE. At its peak, Cantona was one of the largest cities in pre-Columbian Mesoamerica, with a population of 90,000 inhabitants. The site is located in the Cuenca Oriental, a semiarid basin east of Mexico City. We developed a subcentennial reconstruction of regional climate from a nearby maar lake, Aljojuca. The modern climatology of the region suggests that sediments record changes in summer monsoonal precipitation. Elemental geochemistry (X-ray fluorescence) and δ18O from authigenic calcite indicate a centennial-scale arid interval between 500 CE and 1150 CE, overlaid on a long-term drying trend. Comparison of this record to Cantona's chronology suggests that both the city's peak population and its abandonment occurred during this arid period. The human response to climate change most likely resulted from the interplay of environmental and political factors. During earlier periods of Cantona's history, increasing aridity and political unrest may have actually increased the city's importance. However, by 1050 CE, this extended arid period, possibly combined with regional political change, contributed to the city's abandonment. Humans can overcome 'just weather'. They can overcome 'just climate'. Nothing new in our history. Trade by these cultures was on a very large scale. Food can be bought. There was more at work than simple climate.